My best record: 604 points and I am glad that you like it this much. Really, great, very creative! Good Map Design, Good Triggering, Good Sounds, Good Modding! Will surely score in the first 3! Dude this map is awesome. You rock=D. BTW, what is that dog in the beginning good for? I always kill it, but nothing happens. If you would have played with the original one you would know it, and it is not necessary to shoot your dog. The duck fly up, because of your dog frightens them. 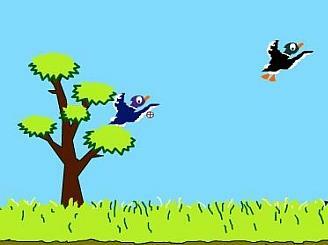 "Duck Hunt" is a third-person shooter arcade scenario, an AoK version of the classic NES game by the same name. As such it has a unique gameplay style, which is a lot of fun to play. I did feel that the game was dragging out by the end, though, as there were long pauses between each level. It would have been more fun if the later levels came with shorter breaks, thus making the gameplay more hectic. As it is it's a lot of fun, but it wears off after a while. Judging balance for arcade-style scenarios is always tricky, as the difficulty is supposed to escalate the further you get, while most custom scenarios are best balanced when they're challenging throughout. This scenario comes with three difficulty levels, and each level becomes progressively harder as you go through the levels, but unfortunately the later levels are a bit underwhelming. The long breaks in the later levels gave me too much time to think, and I think it would have been better to make the break shorter and shorter as you progressed through the levels. As it is, however, it's still good. The gameplay style is unique in AoK as far as I'm concerned. In this scenario, instead of building an economy, razing enemy towns and backstabbing your allies, you sit behind some bushes and kill ducks. It is a novelty scenario, but there are still several creative touches in the scenario mechanics, like the unpredictable flying pattern of some of the ducks, the random spawn points, and more, all earning the scenario a full score. For a 15x15 map, this looks very good. The map depicts a simple reed-covered shore and does so very well. The only thing that could be improved would be to make the reeds a bit more varied, and not just of a single frame. The scenario has no story, and it doesn't need one: it is an homage to a classic NES game, and the gameplay is simple and straightforward; trying to connect it to a more detailed story would take away from what the scenario really is, a novelty arcade experience. The instructions, however, are precise and clear, and ensure that you quickly and easily understand how the scenario works.